上面介绍的这些 Tags are not case sensitive and can be embedded into another to achieve multiple purpose. Define the color of the text.See the following section for how to find a customized color. Define the size of the text. Define the font family of the text. If font name consists of two words, it is commended to use the quotation mark for that name. For example, 'Arial Black', 'Courier New', 'Times New Roman', and etc. Define the alignment of the text. It has the following four parameters: center, left, right, justify. Define the style of the text. It has the following three parameters: italic, normal, oblique. Define the weight of the text. It has the following four parameters: normal, bold, bolder, lighter. Define the background color of the text. The customized color can also be used here. Define the backgroud image of the text, where url(xxxx) defines the location of the image. Refer to the following section to see how to find the URL of the picture. 在这里顺便讲一下如何define a customize color. All the colors are made up from different portion of RGB (Red, Green and Blue). A number ranging from 0 to 255 is used to represent the different shade of each color. The samller the number is, the darker the color is. So if 0 is selected for R, G and B, then the combination will be black. Likewise if 255 is selected for R, G and B, then the combination will be white. In the HTML color code, the hexadecimal number rather than decimal is used to represent the shade of each color. So the color black presented by hexadecimal would be like this 000000, while the white would be FFFFFF. And when you use this customized color code in your post, please also remember to prefixed with a # sign, like this #FFFFFF. The following is an example of a blue word with the honey-dew background. Here are two web sites which list most of the popular-used colors by their Hex code. Click Computer Hope or Complete HTML True Color Chart to open. If you are already a Yahoo user, you can log in your Y! account to access the Flickr.com to upload your pictures there. If you are already a Hotmail user, you can log in your Hotmail account to access the MS's Live.com to upload your pictures there. You can also upload the PPS and PPT over there too, but it is not that wonderful to see that all the contents are exposed. I will do another search to see if there is any better site than this to hold the PPS and PPT files. Both of the above sites are pretty easy and user-friendly. But if you are none of them, and you do not want to be one of them. You can try to set up an account in TinyPic.com, and it is easy and free. 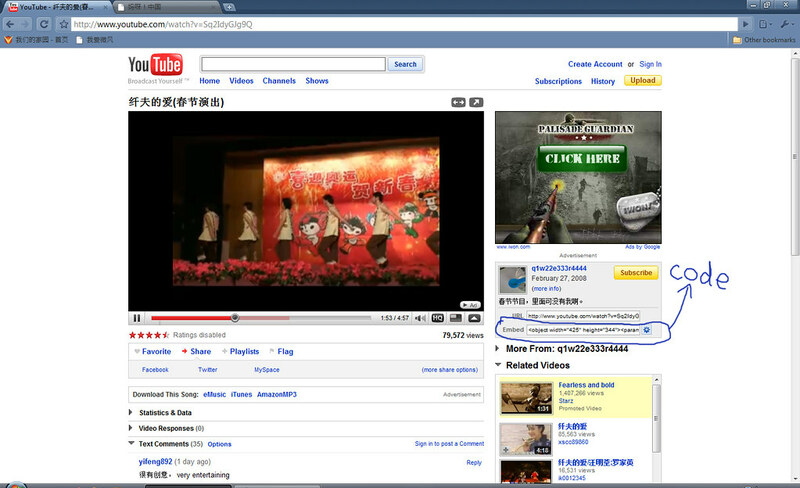 If you are already a GMail user, you can log in your GMail account to access the YouTube.com to upload your videos there. Due to the blockade of the YouTube site in China, you need to upload your video to Tudou.com if you want your video to be accessible by the users in China. After you upload your pictures to one of the above or whatever site, open that picture in you browser. If you browse that picture in MS IE (Internet Explorer), right-click that picture, there pops up menu list, and click "Properties"on that menu list, and then a "Properties" message window opens up, and on the window there is a label called "Address: (URL)", copy that URL, something like http:// ......, and make it ready to use. If you browse the picture in Google Chrome, when you right click that picture there will pop up a menu list, and on that menu list there is one item called "Copy Image URL", just click that item, the URL will be copied. If you browse the picture in Mozilla Firefox, when you right click that picture there will pop up a menu list, and on that menu list there is one item called "Copy Image location", just click that item, the URL will be copied. where src is the location of your picture; border is parameter deciding if you want to have the border for your pic, and 0 means no border and 1 means with border; width decides how wide your pic will be displayed, in some case the loaded pic is very big, so you need to control it. align decides the alignment of your pic. Similarly, after you upload your video you can find your video and copy the text in the "Embeded" box and paste it into the post you are to upload to this site, and your video should be good for us to watch. There are a few parameters you can play around about the video link, but it is not recommended. 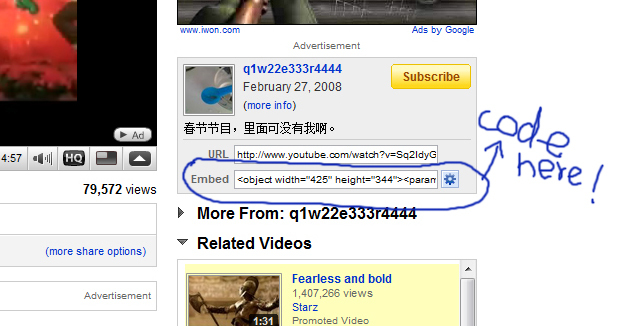 The following is the screen captures showing the location of the YouTube's embedded string of the example video. 点击“贴到博客或BBS”键，有一个小window pops up, 小window上有三个text boxes, “HTML代码”，“FLASH代码”，和“播放页地址”，点击“HTML代码”旁边的“复制”键。或是highlight the text in the text box and copy, 然后paste到论坛网页上即可. If you can have any suggestion, quest, or question about posting, please contact us.